London – Tuesday, 27th January 2015 – The public weigh-in and press conference for the upcoming George Hillyard versus Michal Vosyka, for the World Boxing Union (WBU) International Middleweight title, will take place at Nonna’s Kitchen, 38 Panton Street, London SW1Y 4EA at 3pm on Thursday, 29th January 2015. On announcing the weigh-in and press conference promoter Shyam Batra stressed that this would be an open event, as such members of the public are also welcome to attend. “I am pleased to announce that the weigh-in and press conference for George Hillyard’s WBU International Middleweight title challenge against Michal Vosyka, will take place at Nonna’s Kitchen in London this Thursday. I’m hoping there will be a good turn out from both the press and members of the public, to show some support for our George ahead of the most important fight of his career to date. George has been training really hard for this fight, spending the past few months away from his family, including over the Christmas holidays. George made that sacrifice to make sure he was fully prepared, so I know he would love it if we got a really good turn out fro the Press Conference on Thursday, so we can make it a bit of a party like atmosphere, which hopefully will go a little way towards making up for him missing the Christmas and New Year festivities with his family. Besides George and his opponent Michal Vosyka being in attendance a number of the boxers taking part will also be in attendance, and will be available for questions and interviews. I’m not sure if everyone fighting will be able to attend, but have had confirmation from Tasif Khan that he will be travelling down from Bradford to be there, as will the Hackney based Turkish brothers Siar and Onder Ozgul. The weigh-in will be at 3pm sharp and once this is completed the press conference will begin. 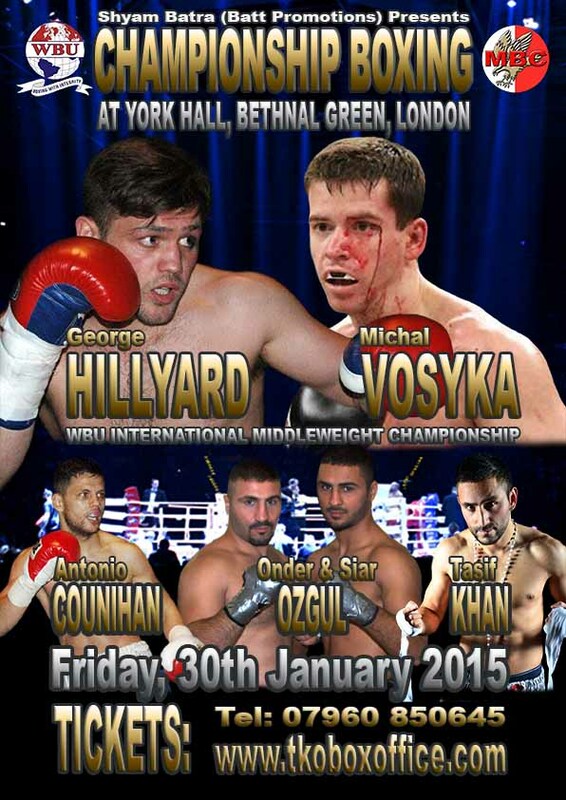 George Hillyard versus Michal Vosyka for the vacant WBU International Middleweight Championship, takes place on the Shyam Batra promoted LEGENDS & PROSPECTS event at York Hall in Bethnal Green, London, on Friday, 30th January 2015.